Over on our forums one user luc4sss has been discussing a method for using RTL-SDR's and perhaps other SDR dongles remotely which does not rely on rtl_tcp, SpyServer or other SDR specific server software. Using an SDR remotely is advantageous because it can allow you to position the SDR closer to the antenna, which results in less signal loss from long runs of lossy coax cable. Instead of rtl_tcp, luc4sss uses a program called VirtualHere, which is a server that can work with any USB device. 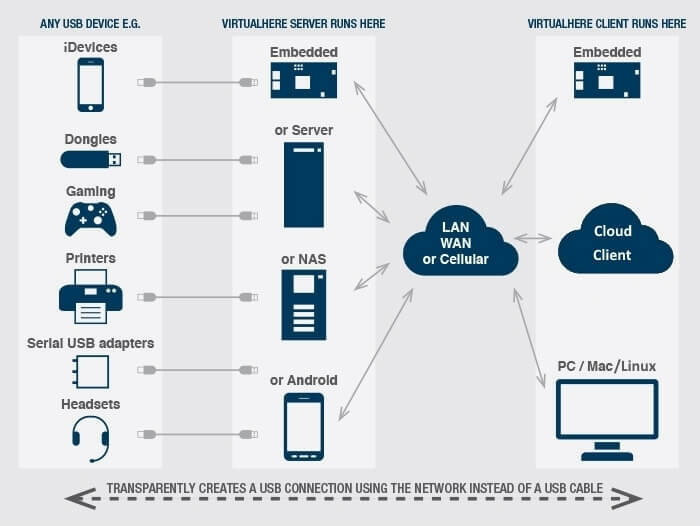 It essentially allows you to use USB devices over a network with the remote device acting as if it was plugged directly into your remotely operated PC. The server can run on single board Linux computers like the Raspberry Pi and luc4sss has been using an $8 Orange Pi Zero 256 MB as his server. With the VirtualHere software and RTL-SDR running on his Orange Pi Zero, he's able to connect to a remote RTL-SDR over his network. He writes that data usage is about 5 - 6 MB/s so a wired Ethernet connection or high quality WiFi connection would be required. In comparison rtl_tcp should use about the same amount of data, but server software with some compression and data saving techniques implemented like SpyServer use much less data and is efficient enough to be used over the internet. We can see the VirtualHere software being very useful for use with RTL-SDR compatible programs that don't have rtl_tcp support, which is most of them. It should also be useful for other SDRs that don't have streaming server software available. VirtalHere is not free as a license costs $49. But it does have a 10-day trial period which supports 1 device being shared at a time. Luc4sss has also uploaded a video on YouTube that shows him running the VirtualHere server and client, and connecting to the remote RTL-SDR with GQRX and dump1090. He also shows the data usage which is about 6 MB/s when running the RTL-SDR at 2.8 MSPS. Operation appears to be problem free and with almost entirely no latency as well. Hehe, fine to see comments who doesent know what whey talking about. 🙂 .. it works perfekt .. as linux server and linus client..(at least for me). BUT it doesent seem to work as good on windows client.. yet., as it seems to be a problem with libusb.dll driver compability. You should be able to setup a link via USB-IP and do the same conceptual operation. Its fake it doesnt work!! !